Tonight’s episode is going to be great and you won’t want to miss it, so be sure to tune in for our Supernatural recap between 8 PM – 9 PM ET! While you wait for the recap make sure to check out all our Supernatural recaps, news, spoilers & more, right here! Sam, Dean, and Cas all sit around Jack’s bedside. He tells them not to be sad. Dean leaves the room upset. Cas comes to try and console Dean. They come back into the room. Sam tells them Jack is gone. They try to figure out their next steps. Dean calls Mary and leaves her a voicemail about Jack. Meanwhile, Sam has packed a bag and left the bunker. Can and Dean run after him in the car. They find Sam down the road on the ground. He tells them he was trying to build a pyre. But the ax broke. They head home and drink to Jack. Dean recalls teaching Jack how to use a map. Meanwhile, Jack has entered another universe where he is running from black liquid. Lily wakes up the next morning with a hangover. He hears talking. Cas and Sam are with Lily Sunder. After some back and forth she offers her magic to get Jack’s soul, but she needs to get into heaven. Cas, Sam, and Dean plan to summon a god from their past to get Lily to help into heaven. Meanwhile, Jack finds his mother in heaven. She is happy to see him until she realizes he is dead. She gets upset. Cane promised he would take care of him. Cas discovers that heaven is playing a distress single through angel radio. He tells Sam and Dean to keep working on the spell to summon the god. Dean asks Lily why she is really helping. She admits she has a sliver of a soul left but her daughter is in heaven. 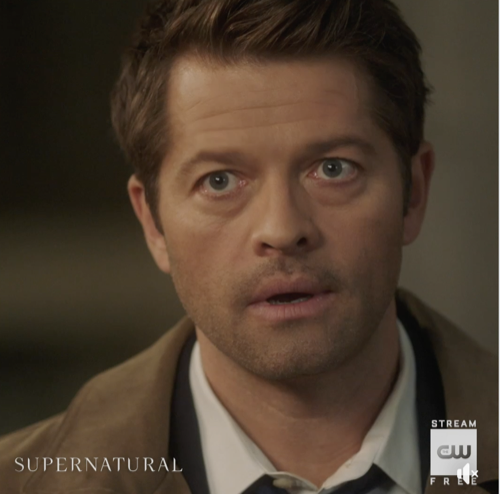 Cas arrives in heaven to find Duma on the ground and another angel dead. She tells him about the black stuff. He tells her he needs to find Jack. She goes with him. At Lil’ Skippers, they see Naomi. She tells them Jack is gone. Heaven is under attack by the shadow – the thing that rules the empty. Sam, Dean, and Lily summon a god to find out where Lily is going when she dies. He takes out an abacus. She is going to hell. They tell him he is stuck in the circle until he changes it. He tells them he doesn’t have the power and they are ultimately affecting their own fate. Sam lets him go. Cas and Duma track down Jack and his mom. They all hug. After Cas tells Jack how they plan to save him, Duma turns into the thing that rules empty. Lily heads for the door now that she knows she is going to hell. Dean shames her. How dare she do this to them when she knows how it feels. Meanwhile, Duma tells Jack she is taking him to the empty. Cas tries to fight her but is thrown across the room. Lily has second thoughts. She tells them she is ready, she will give her magic. She starts chanting while Cas continues to try and fight Duma. He offers himself instead of Jack. She thinks about it. The empty accepts. Duma turns back into herself as Duma returns to herself. Jack is mad at Cas for making the deal. They talk and Jack promises not to tell Sam and Dean what he has done. Jack comes back on the table in front of Sam and Dean. They tell him to finish the spell. He does and his soul is returned. They turn to see Lily. She has died in the chair. Meanwhile, Lily is heading to heaven after helping Jack. Naomi meets with Cas and thanks him for saving them. She thinks he deserves a reward- perhaps the location of Michael. Jack, Cas, Dean and Sam all eat burgers and drink beers together with smiles.